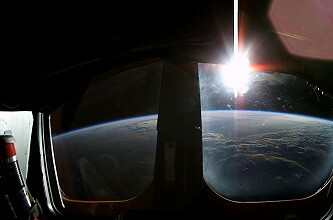 * The shuttle broke apart over Texas. 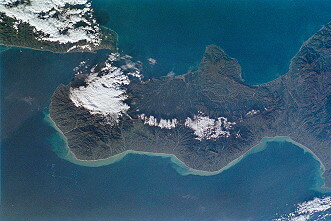 * From launch time until loss of contact. Launch from Cape Canaveral (KSC); mission SH-DM. During the landing the shuttle broke apart over Texas and all seven astronauts died. 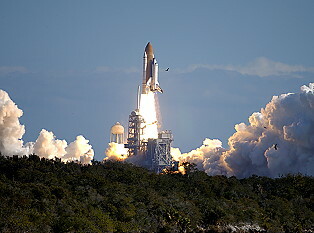 The cause of the accident was determined to be a piece of foam that broke off during launch and damaged the thermal protection system components (reinforced carbon-carbon panels and thermal protection tiles) on the leading edge of the left wing of the Shuttle orbiter, causing an extensive heat build-up. 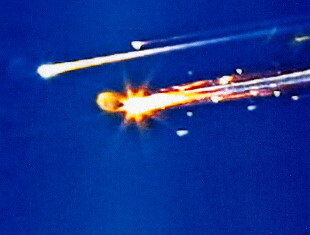 During reentry the damaged wing slowly overheated and came apart, eventually leading to loss of control and total disintegration of the vehicle. 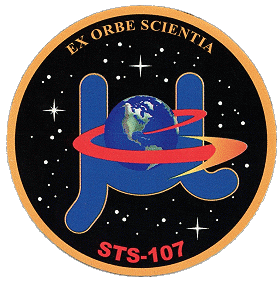 STS-107 carried the SPACEHAB Double Research Module on its inaugural flight, the Freestar experiment (mounted on a Hitchhiker Program rack), and the Extended Duration Orbiter pallet. 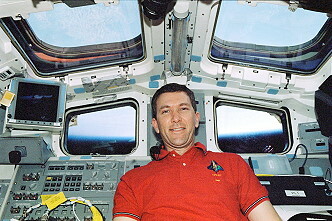 SPACEHAB was first flown on STS-57. 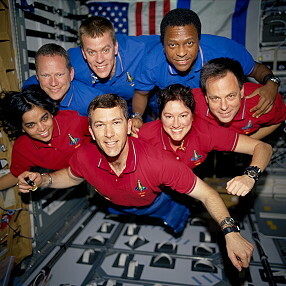 SPACEHAB Inc.'s Research Double Module (RDM) was making its first flight on STS-107. The RDM was a pressurized aluminum habitat that is carried in the space shuttle's cargo bay to expand working space aboard the shuttle. 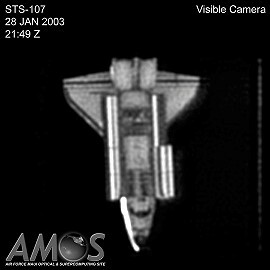 The RDM was connected to the shuttle middeck by a pressurized access tunnel. Boeing-Huntsville performed the RDM's systems integration for SPACEHAB and served as the company's mission integration contractor. 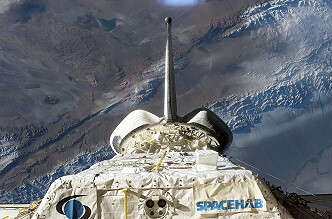 SPACEHAB Single Modules outfitted for research or logistics and Double Modules outfitted for logistics have flown on 15 space shuttle missions to date. The RDM was approximately 20 feet (6.1 meters) long, 14 feet (4.3 meters) wide, and 11 feet (3.4 meters) high. 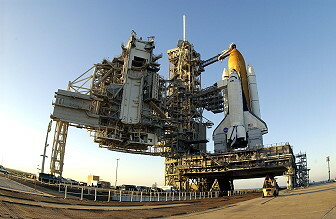 Outfitted as a state-of-the-art laboratory, it had a pressurized volume of 2,200 cubic feet (62.3 cubic meters) and could hold up to 61 space shuttle middeck lockers (up to 60 pounds (27.2 kg) and 2 cubic feet (0.05 cubic meters) each) plus six Double Racks (1,400 pounds (635 kg) and 45 cubic feet (1.3 cubic meters) each). The RDM also could accommodate International Space Station Payload Racks (ISPRs). The Module had two viewports and could carry powered rooftop payloads (three on STS-107) using feed-through plates in the module ceiling. 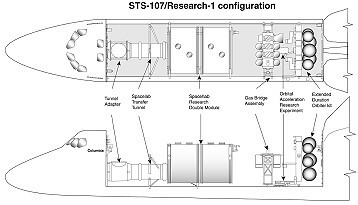 The RDM, which had a payload capacity of 9,000 pounds (4,082 kg), carried about 7,500 pounds (3,402 kg) of research payloads on STS-107. An additional 800 pounds (363 kg) of SPACEHAB integrated payloads were flying on the shuttle middeck, making a total of 8,300 pounds (3,765 kg) of research payloads on STS-107. The seven crewmembers worked in two shifts throughout their 16 days in space. 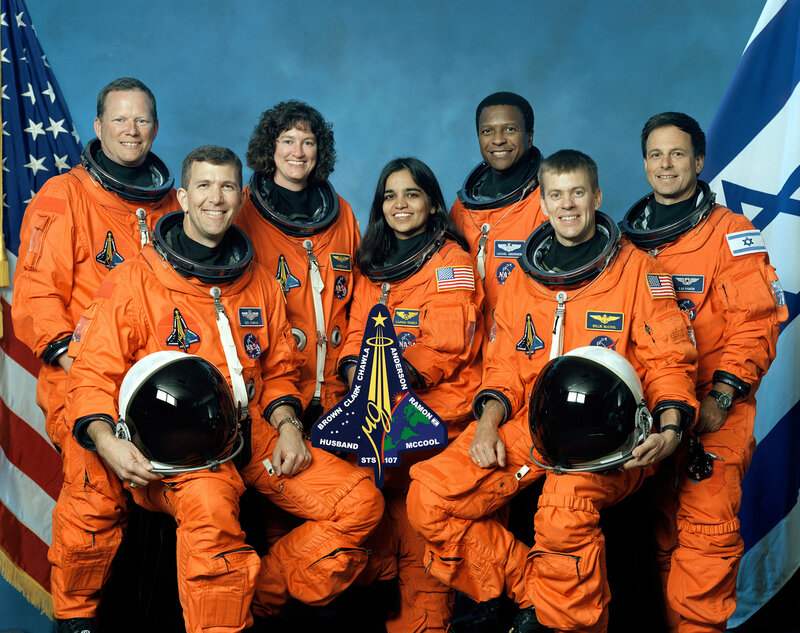 The Red Shift included Rick Husband, Kalpana Chawla, Laurel Clark and Ilan Ramon, while the Blue Shift will include William McCool, David Brown and Michael Anderson. The seven astronauts worked round-the-clock to complete a multidisciplinary research program involving 32 payloads with 59 separate investigations. 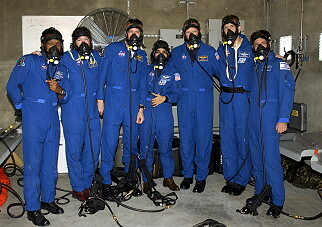 More than 80 experiments were conducted to study Earth and space science, advanced technology development and astronaut health and safety were done. There were so different experiments as crystal growth, bone density, cancer cell growth (cancer tumors growing strong in space) and flame behavior in microgravity. 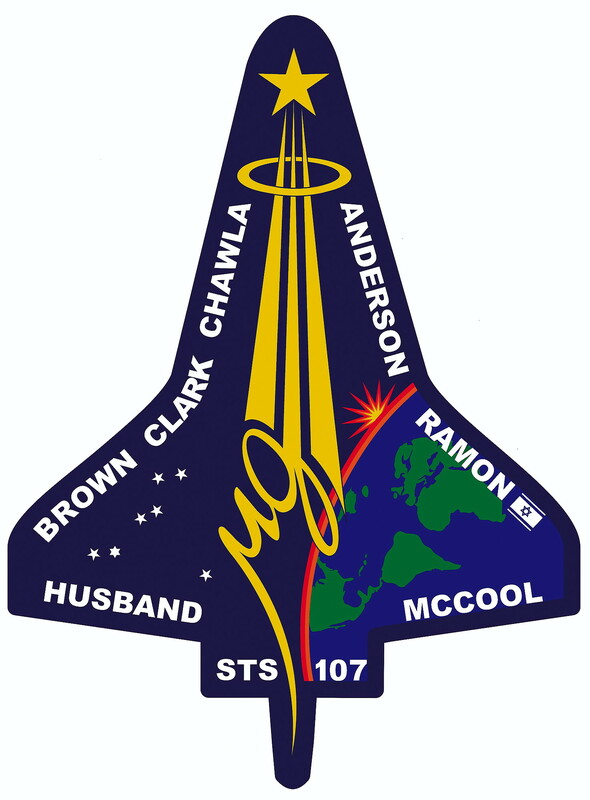 Four Israeli-proposed experiments are slated for the Columbia mission. They include the Mediterranean-Israel Dust Experiment camera designed to measure the impact of aerosols on cloud formations and rainfall; an examination of the phenomenon of red and blue flashes of light - known as sprites - that appear during lightning storms; an experiment on the effects of weightlessness on bacteria; and a eighth grade student chemistry project. Payload Specialist Ilan Ramon was involved in these experiments. Experiments in the SPACEHAB RDM included nine commercial payloads involving 21 separate investigations, four payloads for the European Space Agency with 14 investigations, one payload/investigation for ISS Risk Mitigation and 18 payloads supporting 23 investigations for NASA's Office of Biological and Physical Research (OBPR). In the physical sciences, three studies inside a large, rugged chamber will examine the physics of combustion, soot production and fire quenching processes in microgravity. These experiments will provide new insights into combustion and fire-suppression that cannot be gained on Earth. An experiment that compresses granular materials, in the absence of gravity, will further our understanding of construction techniques. This information can help engineers provide stronger foundations for structures in areas where earthquakes, floods and landslides are common. Another experiment will evaluate the formation of zeolite crystals, which can speed the chemical reactions that are the basis for chemical processes used in refining, biomedical and other areas. Yet another experiment will use pressurized liquid xenon to mimic the behaviors of more complex fluids such as blood flowing through capillaries. In the area of biological applications, two separate OBPR experiments will allow different types of cell cultures to grow together in weightlessness to enhance their development of enhanced genetic characteristics - one will be used to combat prostate cancer, the other to improve crop yield. Another experiment will evaluate the commercial usefulness of plant products grown in space. A facility for forming protein crystals more purely and with fewer flaws than is possible on Earth may lead to a drug designed for specific diseases with fewer side effects. A commercially sponsored facility will house two experiments to grow protein crystals to study possible therapies against the factors that cause cancers to spread and bone cancer to cause intense pain to its sufferers. A third experiment will look at developing a new technique of encapsulating anti-cancer drugs to improve their efficiency. 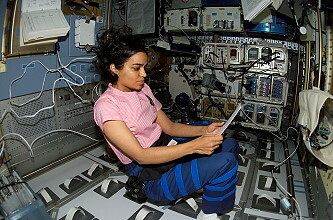 SPACEHAB was also making it possible for universities, companies and other government agencies to do important research in space without having to provide their own spacecraft. The Canadian Space Agency is sponsoring three bone-growth experiments, and is collaborating with ESA on two others. 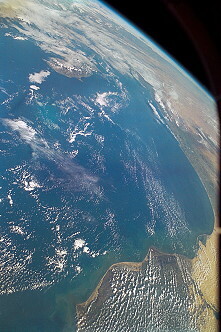 The German Space Agency will measure the development of the gravity-sensing organs of fish in the absence of gravity. A university is growing ultra-pure protein crystals for drug research. Another university is testing a navigation system for future satellites. The U.S. Air Force is conducting a communications experiment. Students from six schools in Australia, China, Israel, Japan, Liechtenstein and the United States are probing the effects of spaceflight on spiders, silkworms, inorganic crystals, fish, bees and ants, respectively. Last update on January 04, 2019.